123Landlord makes it easy to add additional users to your account - these users can be employees or owners, or anyone you wish to have access to your tenant and property data. 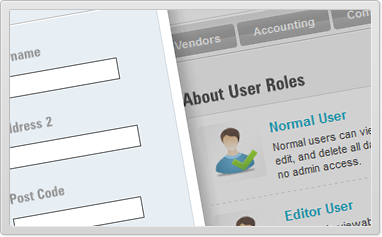 Add users to allow access to your data by employees, assistants, etc. These people can perform data entry and run reports from any computer, anywhere in the world. 123Landlord uses simple role-based security: users can be Admins, Editors, or Viewers - more info on our blog! A built-in messaging system allows you to send notifications to any employees and users on your account. Users will see their messages on the dashboard when they log in - keep everyone on the same page! 123Landlord provides a "secure browsing mode" which employs the same secure, encrypted technology used by bank software and websites. This ensures your data has not been compromised, even when using the software over public networks.